The Alamo fell to Mexican forces on this day in 1836, after a 13-day siege over whether the land would be controlled by Mexico or settlers of Texas. “The Defense of the Alamo” was a 1953 episode of the TV series “You Are There,” hosted by Walter Cronkite of CBS News. Cronkite later went on to anchor “The CBS Evening News” and live coverage of many manned space flights. 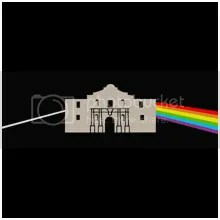 He also hosted a Saturday morning revival of “You Are There” in the 1970s, which included a story about the Alamo. Cronkite’s last night on the “Evening News” was March 6th, 1981. March 6th is the birthday of Mercury astronaut Gordon Cooper (1927), and the first woman in space, Valentina Tereshkova (1937). It’s also the birthday of a guy who knows about “The Dark Side of the Moon” — Pink Floyd musician David Gilmour (1946).